I Cord, Navajo Plying et Facebook and Blogger of course have something in common, Crafty Andy. There are many things that are great with facebook, but one of them is not the greatest. Facebook has no real appeal to me besides getting to see what my friends are up to, but I can do that in the internet anyway. 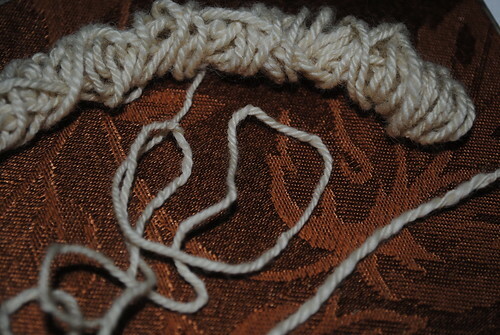 There are also game after game after game, but nothing like a true craft such as knitting, crocheting are. Facebook the same as Second Life have a place, but nothing beats an exciting real life, which I do possess and keep on making every day. If facebook goes for pay, It will be a great experiment, but I will be one of the free floaters. I may indulge in the virtual world once in a while, but there is nothing like knitting and crocheting with my friends at the Cafe Trieste, the park or one of the Men Knitting Retreats. I have take a break from Facebook, but this feed will be posted there from my personal blog. I decided to take a break from Facebook, because is ok to be away from it lol! The I-Cord rediscovered is a great piece of knitting. 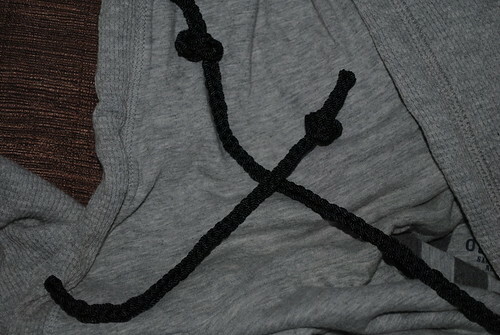 I was in need of a cord for the hood of my jacket, somehow it had dissappeared with the washings. I decided I will make it out of omega nylon thread and here it is. Last Saturday I was lucky and able to take a trip to A Verb For Keeping Warm , in Berkeley , where I was able to attend a Class with WonderMike from Fiber Beat. The Class was on Navajo Plying while making yarn on a drop spindle, which was a very easy task and you can do it on the go, once you are done you are done. I will have to say that it will not be possible to do this task the same way on a wheel, it would not be possible without a lot of maneuvering if at all possible. Navajo Plying gives you a nice three ply yarn that is is very strong, after all it has been done for many , many years. 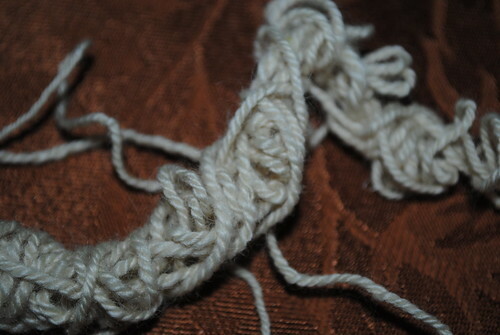 I believe that if it is done properly , you will have a well balanced yarn that will respond with strength and beauty. A three ply yarn s very rounded and has a beauty of its own. Thanks for stopping by.